Note: A shortened version of this release was issued earlier today by the U.S. Department of Energy. Jim Siegrist, associate director of the DOE Office of High-Energy Physics, and Maurizio Greganti, deputy chief of mission for the Embassy of Italy to the United States, sign an agreement to collaborate on Fermilab’s PIP-II project. 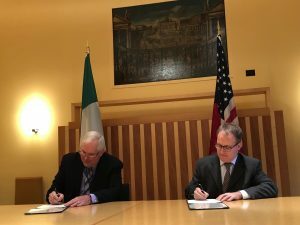 Today the U.S. Department of Energy (DOE) and Italy’s Ministry of Education, Universities and Research (MIUR) signed an agreement to collaborate on the development and production of technical components for PIP-II, a major U.S. particle accelerator project to be located at DOE’s Fermi National Accelerator Laboratory in Batavia, Illinois. The signing took place at the Embassy of Italy in Washington. Italy and its National Institute of Nuclear Physics (INFN) will provide major contributions to the construction of the 176-meter-long superconducting particle accelerator that is the centerpiece of the PIP-II (Proton Improvement Plan-II) project. The new accelerator will become the heart of the Fermilab accelerator complex and provide the proton beam to power a broad program of accelerator-based particle physics research for many decades to come. In particular, PIP-II will enable the world’s most powerful high-energy neutrino beam to power the international Fermilab-hosted Deep Underground Neutrino Experiment (DUNE). The INFN Laboratory for Accelerators and Applied Superconductivity is expected to build components for the PIP-II accelerator. Based in Segrate, Italy, the laboratory is a center of excellence on an international scale for the development of advanced particle accelerators technologies. At the signing, representatives from both countries recognized the long tradition of collaboration between Italian scientists and Fermilab, named after Italy’s own Enrico Fermi. “Following a long tradition of collaboration, the engagement of INFN on the construction of the PIP-II accelerator constitutes an important step in the context of unraveling neutrino properties through the ambitious DUNE project,” said INFN President Fernando Ferroni. The centerpiece of the PIP-II project will be an 800-million-electronvolt superconducting linear accelerator, which will modernize the front end of the existing Fermilab accelerator chain and provide a platform for future enhancements. The new accelerator will feature acceleration cavities made of niobium and double the beam energy of its predecessor. Such a boost will enable the Fermilab accelerator complex to achieve megawatt-scale proton beam power. In addition to Italy, other international partners are making significant contributions to PIP-II. They include India, the United Kingdom, and France. DOE’s Argonne and Lawrence Berkeley National Laboratories are also contributing key components to the project. The partnership is one example of the increasingly global character of particle physics-related projects. The PIP-II accelerator complex will be made available to the international particle physics community and will extend the scientific discovery potential beyond that which currently can be reached. This 40-second animation provides an overview of the PIP-II project. To learn more, visit pip2.fnal.gov. INFN, Istituto Nazionale di Fisica Nucleare, is the public Italian research institute dedicated to the study of the fundamental constituents of matter and their interactions. INFN conducts theoretical and experimental research in the fields of subnuclear, nuclear and astroparticle physics. Fundamental research in these areas requires the use of cutting-edge technology and instruments, developed by the INFN at its own laboratories and in collaboration with industries. All of the INFN’s research activities are conducted in close collaboration with Italian universities and undertaken within an international framework.